The most important and lasting plans you can make involve taking care of your loved ones when you are no longer able to do so. 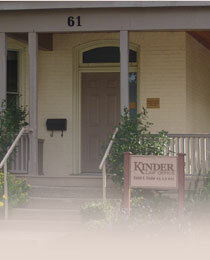 Kinder Law Office can help you protect yourself and your estate through effective Estate Planning and Administration, the creation of an accurate Will and Powers of Attorney, and/or the establishment of a Family Trust. Do you need a Will and Powers of Attorney? Do you care who gets your property and other assets if you die? Do you care who controls your assets if you die or are incapacitated? Do you care who is appointed guardian of your minor children if you die? Do you care what happens to your assets if both you and your spouse die? Do you assume that your spouse will automatically inherit everything if you die or control everything if you are incapacitated? If you’re not legally married, do you assume that your partner will have the same rights as a legally-recognized spouse if you die or are incapacitated? If you answered "yes" to any of these questions, you may be disappointed to know that, without a Will and Powers of Attorney, your wishes will not necessarily be respected and it may be necessary for your representative to obtain government approval to deal with your assets. This can be an expensive process that may not result in your wishes being followed. Wills and Powers of Attorney are not just for the rich. Most people have more assets than they realize but, regardless of how much or how little money you have, a Will ensures that whatever personal belongings and assets you do have will go to the family or beneficiaries you designate. Without a Will and Power of Attorney, government legislation will predetermine the distribution of your assets. If you have children, a Will is a must to ensure that you get to choose your children's guardian. If you are newly married, any Will you had previously made automatically becomes invalid. If you are recently separated or divorced, your old Will probably doesn’t reflect your current wishes. When you create your Will and Powers of Attorney, professional advice is critical – it’s often what you’ll miss that will cause problems. Simply put, Wills and Powers of Attorney are plans that help reduce chaos, delays and unnecessary expense. Few people plan to die or become incapacitated in the near future, but if this does happen, you could be subjecting your family and loved ones to confusion and anxiety at what is already a difficult time. Creating your Will and Powers of Attorney does not have to be a difficult and costly process. Most of our clients are surprised and pleased at how easy it is. Invest just a couple hours and a few hundred dollars and get real peace of mind for you and your family. One call to our office and our trained, knowledgeable staff will get the process started. And, before your wishes are finalized, you’ll review the details personally with David to ensure that everything is properly covered. Like many of our clients, you’ll leave our office thinking, "Now, that’s a relief!" A Will is a written document that only comes into effect upon your death and clearly expresses your wishes for the division of your assets. A Power of Attorney for Property is a written document in which you appoint a person to deal with your financial assets in your absence or disability. A Power of Attorney for Personal Care is a written document in which you appoint a person to speak on your behalf with your medical care givers in the event of your physical or mental incapacity. It is important to note that Powers of Attorney become invalid upon your death. Don't have a will or power of attorney? 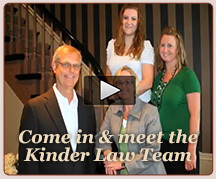 Contact Kinder Law Office.